The ugly buildings that characterize the modern landscape are inferior not only to the great cathedrals of medieval Europe and the temples of ancient Egypt and Greece, but even to lesser buildings of the more recent past. The great masterworks of our ancestors spoke to humanity’s higher nature. Architect Herbert Bangs reveals how today’s dysfunctional buildings bring out the worst in humanity, reinforcing that which is most base within us. He shows how, through the ancient laws of proportion and number, architecture once expressed the harmonious relationship between man and the cosmos. In early times, the architect worked within a sacred and esoteric tradition of creating structures through which human beings could gain insight into the nature of the divine reality. Today, that tradition has been abandoned in favor of narrowly defined utilitarian principles of efficiency and economy. In The Return of Sacred Architecture, Bangs provides the key to freeing architecture from the crude functionality of the twentieth century: the architects of the modern human landscape must find the deep-felt connection to the cosmos that guided the inner lives of those who built the temples of the past. The form of their buildings will then reflect the sacred patterns of geometry and proportion and bring forth greater harmony in the world. Herbert Bangs was a designer for R. R. Buckminster Fuller’s architectural firm, Geodesics, and was the Baltimore County architect and principal master planner. He and his wife live in a solar home he designed and built in Ruxton, Maryland. There are a few books that everyone should read, regardless of their discipline or degree of interest in esotericism--[This book] is one of them. . . . End the madness of modernity. Buy this book, give it away to everyone you know, and hope, pray, that its seeds will take root, and one day we can begin to build a world that reflects our vision of heaven as did our ancestors. 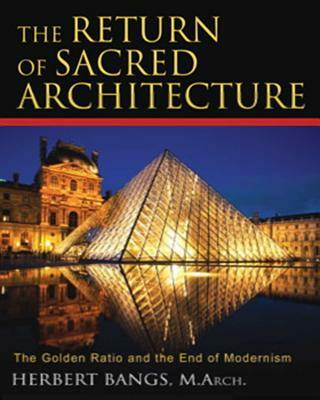 "Herbert Bangs brings extraordinary insights into his scholarly yet impassioned exploration of sacred architecture. . . . THE RETURN OF SACRED ARCHITECTURE is a clarion call for adopting a more intuitive approach to design and a better appreciation for the sources of divine inspiration. I give this book my highest recommendation." "The thesis is well presented, enhanced by numerous illustrations and examples and enlivened by personal glimpses of leading designers and architects. Such clear-sighted candor and spiritual solutions are overdue, refreshing, and very encouraging."